Exploding Sun (2013) - Sci-fi-central.com. Canada  2013  174m   Directed by: Michael Robison.  Starring: David James Elliott, Anthony Lemke, Natalie Brown, Alex Weiner, Mylène Dinh-Robic, John Maclaren, Jane Wheeler, Bruce Dinsmore, Allison Graham, Frank Schorpion, Julia Ormond, Richard Jutras, Robert Crooks.  Music by: James Gelfand. A spaceship with passengers -- including the president's wife -- is on its maiden flight around the moon and back to Earth, but a massive solar storm blows the craft off course and toward the sun. 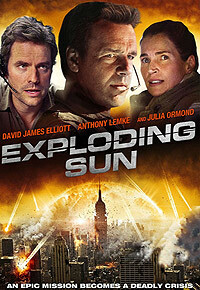 Two astronauts who do not particularly get along aim to save the world before the sun explodes. So yes, the title is self explanatory. However this means that Don Wincroft (David james) and fellow astronaut Craig Bakus (Anthony lemke) have to put their differences aside and try to forgive each other as Don Wincroft is now the husband of Craig Bakus' wife Cheryl Wincroft (Natalie Brown), what makes matters worst? Is that these two big headed astronauts used to be best friends. Jeff Schechter who is the writer of this improbable science fiction, may have not gotten all the facts accurate when it comes to the scientific aspect of things to say the least, unless you believe that the sun is not hot or big enough to burst a spaceship that is a billion times smaller into pieces, but my favorite was that people could reach the moon in less than 8 hours, baring in mind I could get to Africa in that exact time. However we have to remember that this is a fiction movie and anything can happen, also the beautiful cinematography by Michael st. Martin and the sound effects which weren't too overpowering created the perfect amount of tension and excitement. The performance by the all Canadian cast (including the director Michael Robison) was at a satisfactory standard. The acting was convincing throughout the movie. Nevertheless, we are introduced to various of different characters with all very different status from the president of the United States to very intimidating and angry afghan citizens to a very down to earth local nurse. One cant help but notice that Jeff Schechter wanted to capture more than the tragedy of the sun exploding, and in 3 hours he sure did. We see how even people who couldn't have a more different lifestyle and no matter how powerful one is everyone has emotions and it really highlights the important things in this world including family and friendship. Overall the movie had a deeper message than just the sun exploding and even though the the scientific facts weren't up to scratch, it was a very enjoyable and touching film. I found it somehow inspiring as it restored my faith in humanity while people strived to save themselves and each other. I recommend you watch it if you have three hours to spare. Review by Kidst_21 from the Internet Movie Database.